Philadelphia's Old City is home to a large number of historical sites, galleries, restaurants, and bars, and is known for its active nightlife and cultural opportunities. 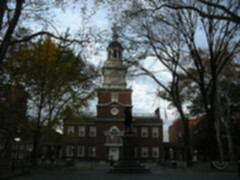 Old City Philadelphia is the nation’s most historic square mile. This vibrant old-world neighborhood is the home to many shops, galleries, restaurants, bars and clubs. 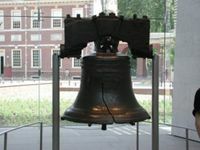 Philadelphia’s most popular historic attractions — the Liberty Bell, Independence Hall, the National Constitution Center, Betsy Ross House, Penn’s Landing — and much more are all just minutes from each other. The area is also within an easy walk of the Pennsylvania Convention Center and several nationally renowned hospitals. For shopping, visit the 3rd Street Corridor from Chestnut Street to Vine to enjoy art, design and fashion hosted by the region's most exciting independently owned shops. It’s a haven for fashionistas and clothing is tax-free. The area has easy access to all major transportation arteries; it is just ten minutes by car from the Philadelphia International Airport and Amtrak’s 30th Street Station. Old City hosts a lot of nightlife; expect to see a young, professional crowd here on weekends. The neighborhood is a party inside and out of the clubs, resaturants, and bars, with live music frequently playing on the streets. Penn's Landing is on the waterfront, where you'll find the Comfort Inn, the Hyatt Regency and the Sheraton. Restaurants there include the Chart House, Moshulu, Hibachi and La Veranda. Every New Year's Eve and Independence Day, crowds gather on the Great Plaza to watch the fireworks. Nearby is Festival Pier, where many concerts are held. You can find parking structures and rates with the PPA Parking Finder . Parking along the streets in Old City is metered, scarce and frequently with a two-hour limit. Numerous SEPTA bus routes serve the Old City, as well as the PHLASH Trolley  trolley that operates part of the year. The Market-Frankford line has stops along Market St (2nd, 5th, 8th, 11th/Market-East). 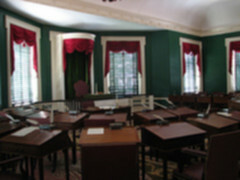 Some historic sites in Philadelphia are associated with the Independence National Historic Park but are not located within its boundaries or the boundaries of Old City. 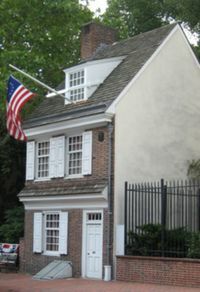 These include the Gloria Dei (Old Swedes') Church in South Philly, the Benjamin Franklin National Memorial at the Franklin Institute in Center City West, and the Edgar Allan Poe National Historic Site in North Philly. If you happen to be in Philadelphia on the first Friday of the month, you must attend First Friday . From 5PM-9PM, art and design galleries along with boutiques housed in historic industrial spaces of Old City like Rodger LaPelle  (most of which can be found in the area between Front and 3rd Streets, and Vine and Market Streets) open their doors to celebrate new monthly exhibitions. But the art, design and fashion is only half the story. First Friday is an ideal time to watch the different communities living in Philadelphia mingle, and watch the sun go down over the city. It's Philadelphia at its best. In addition to myriad art galleries, Old City boasts design studios, modern furniture showrooms and amazing clothing boutiques. Also, it is the restaurant-supply outlet center of the city. The 3rd Street Corridor located on 3rd Street between Chestnut and Vine Streets, is a premier shopping row which hosts over two dozen of the city's finest boutiques in the Philadelphia region. From vintage 70's clothing at Sazz, european furniture at La Roche Bobois, eclectic furniture at Reform, incredible contemporary and select vintage for men and women at SUGARCUBE, and womenswear at Vagabond. 3rd Street Corridor has the city's best locally owned independent retailers. Also of note are the array of salons and spas like Moko, Lakshmi, Hush, and Spa Terme Di Aroma. A nice array of salons, spas, and beauty hot spots can be found in Old City. Visitors planning to spend the day can relax by booking beauty treatments or by finding the perfect beauty product. Double Espresso Bar, 211 Chestnut St, +1 215 351-5171, . M-Th 7AM-7PM, F 7AM-10PM, Sa 9:30AM-7PM, Su 10AM-6PM. Free Wi-Fi available. Comfy atmosphere. Great place to get work done, meet friends, play board games or simply grab a cup of coffee. Spacious seating area. Old City Coffee. For a great (strong) cup of coffee try Old City Coffee on Church Street between 2nd and 3rd just north of Market. The Crocodile Lounge, 110 Chestnut St, +1 267 687-1450, [http//www.crocodilephilly.com]. 2PM-2AM. The Crocodile Lounge has gained immense popularity since its opening in 2010. Known for their free slice of pizza with every drink order, and excellent place for dancing, it is a must when visiting old City. Aromatic House of Kabob 113 Chestnut St. +1 215 923-4510. One of the many hookah (flavored tobacco) bar's in Old City. At most times quiet, gives the feeling of seclusion from the hustle and bustle of the city. Serves an eclectic menu of Persian and Middle Eastern appetizers. Ordering one of their smoothies and juices is a definite must. BYOB. Great service and friendly atmosphere. This page was last edited on 17 March 2019, at 14:46.